Does a weak economy spell trouble for Saguaro Ranch and its owner, Stephen Phinny? 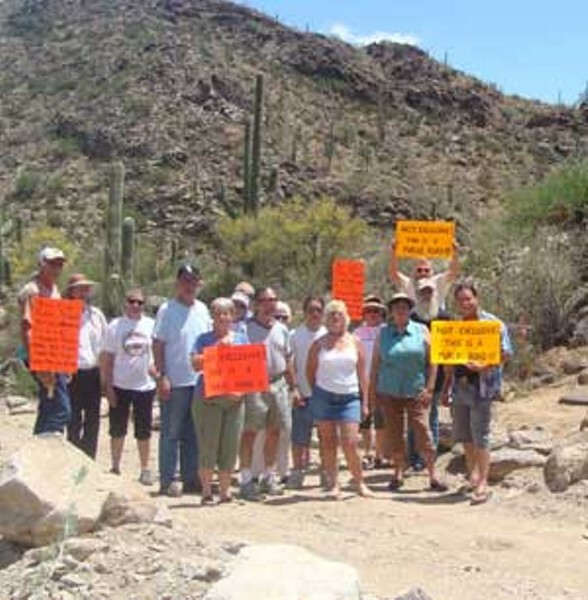 Mari Herreras Forget these angry neighbors fighting for public-access roads; the economy could be Saguaro Ranch developer Stephen Phinny's worst nightmare. When Stephen Phinny got a $50 million loan to complete his Saguaro Ranch development in Marana, a press release from New Jersey-based Kennedy Funding described his proposed 1,035-acre luxury project as "the best residential subdivision we have seen, not just in Arizona or the Southwest, but the entire country." The lender went on to describe the region's five-year-high in job growth and increasing real estate values--perfect for selling 180 lots on four or five acres with pristine views of the Tortolita Mountains, at $1.25 million each. That was in early 2006, before the Tucson area began wading through a recession clouded by declining property values, foreclosures and increasing unemployment. That was also before Phinny began laying boulders across public-access roads in an effort to lay a legal foundation to turn those paths into private roads. After all, Phinny was marketing the gated community as so exclusive that it had only one way in, through a 700-foot tunnel blasted out of a hill. In June, however, a group of neighbors that had been using those public-access roads filed a lawsuit asking the courts for a judgment regarding the public easements. Those neighbors anticipate a final judgment soon. How simple life would be if neighborhood relations were Phinny's only problem--but judging from records the Weekly has obtained from Pima County Superior Court, the economy and Phinny's business practices may have finally caught up with him. In the past six months, Phinny and his development company have faced more than nine lawsuits that could potentially add up to several million dollars in judgments regarding unpaid debt, and alleged fraud and misrepresentation. According to Phinny's Tempe-based attorney and spokesperson, Craig Keller, that's just the nature of business when you run a multi-million-dollar company. Phinny, however, isn't a seasoned developer. According to a press release from Saguaro Ranch, prior to acquiring the Saguaro Ranch property in June 2000, Phinny's only foray into development was as a partner in Gray Head, a Telluride, Colo.-based real estate development firm he founded with two other partners in 1996. Keller defends Phinny, pointing out the national economic crisis and saying that some of those lawsuits are just economic opportunism rearing its head to make a dollar off Phinny's success. "Saguaro Ranch is a large project ... and the result is there will be some disputes from time to time," Keller says. "But the subdivision is strong and continues to be." For the past three months, Keller has kept busy with a dizzying array of motions filed on behalf of his client and Saguaro Ranch to address the laundry list of lawsuits. One of those lawsuits was filed by U.S. Foodservice in September regarding almost $40,000 in unpaid food bills for the development's restaurant, McClintock's. The food bill has since been paid, although according to court documents, the bill for $2,000-plus in attorney's fees now owed to U.S. Foodservice has not. Three other lawsuits are also for unpaid bills: from Copeland Construction and Development for $656,546, Mechanical Maintenance for $127,152.32, and Arizona Equipment Rental (doing business in Tucson as Volvo Rents) for $22,911.02. A lien was filed in October by equipment-rental company Earhart Equipment for $67,213, although a lawsuit has yet to be filed. One personal lawsuit was filed in October by Lorraine Edminster, an interior decorator, who is asking that Phinny reimburse her for the $39,042.15 used to purchase a bed for his master bedroom and other furnishings for his home in June 2007. Two other lawsuits get to the heart of the access issues and other business practices. Saguaro Ranch property owner and Tucson resident Courtland Gettel filed a lawsuit regarding back rent owed for property used by Saguaro Ranch for its sales office off Thornydale Road, adjacent to the development. A separate complaint filed by Gettel claims fraud and misrepresentation regarding the purchase and sale of a lot that Gettel bought at Saguaro Ranch in April 2007 for $2.6 million. In his lawsuit, Gettel contends that Saguaro Ranch failed to disclose that there are other entrances into the development--the disputed public easements. An exhibit attached to the lawsuit includes a magazine advertisement for the development: "A location so protected, a mountain passageway provides its only entry." The other lawsuit focusing on access issues, filed by Tapestry Properties (which owns nine parcels adjacent to Saguaro Ranch), challenges the right of 14 Saguaro Ranch property owners to use a dirt path that goes through Tapestry Properties' land. The Saguaro Ranch purchase agreements included ingress and egress rights to use the Tapestry property, but Tapestry contends that's not legal and filed suit against the individual property owners. Saguaro Ranch, through Keller, is now representing all the property owners who Tapestry is suing. Lawsuits aside, there is other documentation that provides more information about Saguaro Ranch's future: Phinny's latest divorce proceedings. Although Phinny has been divorced since Nov. 3, 2004, attorneys were back in court recently to negotiate financial issues with a new security agreement between Phinny and his ex-wife. In those court documents, Phinny's attorney wrote that the $50 million loan given by Kennedy Funding in 2006 matures in December, and that Phinny has been working on refinancing the loan with a new line of credit. The document goes on to imply that 2008 hasn't been the best year for Phinny's luxury project, noting that Phinny had to borrow and advance "substantial sums to Saguaro Ranch," especially in 2008, with the slowdown in the real estate market. In the agreement ruling issued Oct. 15, it notes Phinny also had to borrow $50,000 to pay attorneys' fees for the continued divorce proceedings. Also, if the Saguaro Ranch project is to continue, Phinny needs more cash. The development's summer 2006 newsletter reported that the first $50 million loan was going to pay for the construction of a guest ranch and spa, which was to be completed by 2008. That hasn't happened. A group of half-built casitas also sit abandoned. It's been reported that 50 lots have been sold as part of phase one--and any additional lots can't be developed until the second and third phases of the project provide additional infrastructure to remaining areas of the property.